How to transfer your emails (past, present and future) from Google Apps for Business account to your GMail account. Login to your Google Apps account and enable POP Download (Gear Icon >> Settings >> Forwarding and POP/IMAP). Choose Enable POP for all mail (even mail that’s already been downloaded). Login to your GMail account and head to Accounts section in Settings (Gear Icon >> Settings >> Accounts). 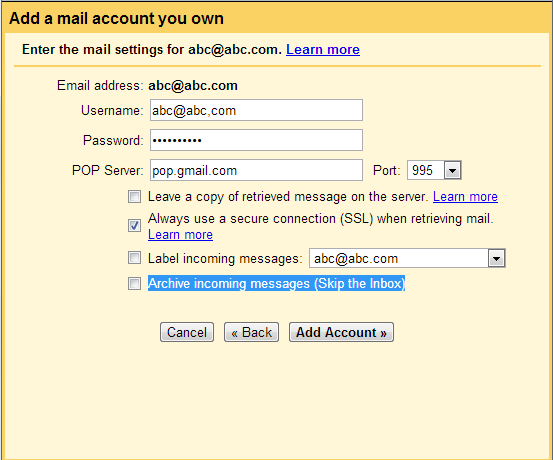 Click on Add a POP3 mail account you own. This will open a new window. Enter your Email address in the first step of the new window. Uncheck Leave a copy of retrieved message on the server. Google Apps keeps a copy of the email on its account so you DONT have to choose this option. If you do, Mail Fetcher won’t let you move ahead. Emails will begin to import into your GMail account.